Mr and Mrs B were both experiencing declining mobility. 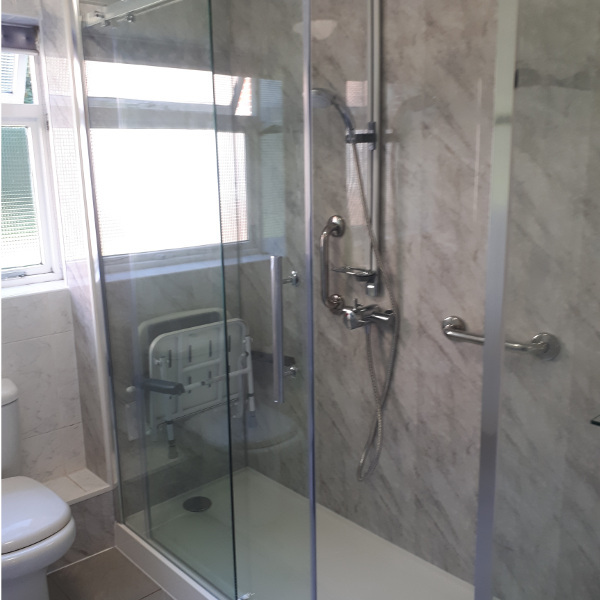 After one of them had a back operation, they decided to make their bathroom easier to use by replacing their bath tub with an easy to access shower. They contacted Absolute Mobility for a quote and decided to go ahead with the work. This involved removing the bath tub and installing a new easy access shower with a shower seat. The following photos illustrate the work involved for removing a bath and replacing it with a shower. First the bath was removed. You’ll note in one of the pictures that damp was revealed after removing the bath, evidence that the bath had been leaking for some time. 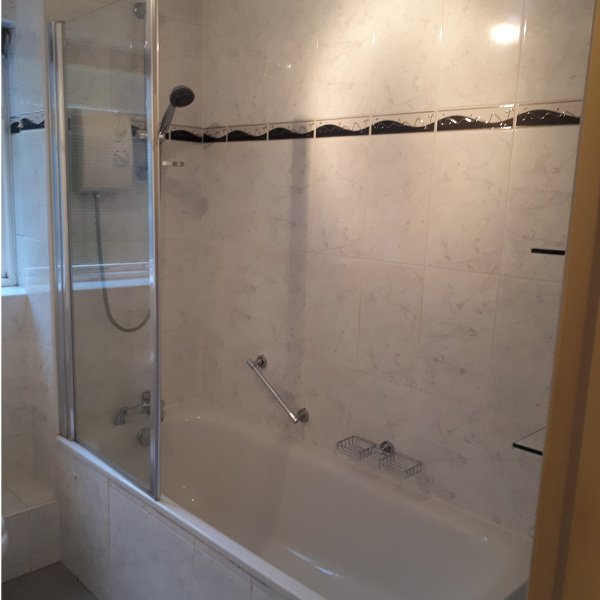 After removing the bath, the site was prepared to receive the new shower enclosure and wall mounted shower. Next the shower tray was fitted and connected to the waste pipe. In this case a shower tray with a 110mm step height was used. The reason for choosing a tray with a small step height, rather than level access, was due to the flat having a concrete floor. Concrete floors are not always suitable for level access showers because there is often insufficient screed in the floor to recess the shower tray. The 110mm high tray avoids the difficulty of recessing a level access shower tray into the floor, whilst still providing an easily accessible shower solution. 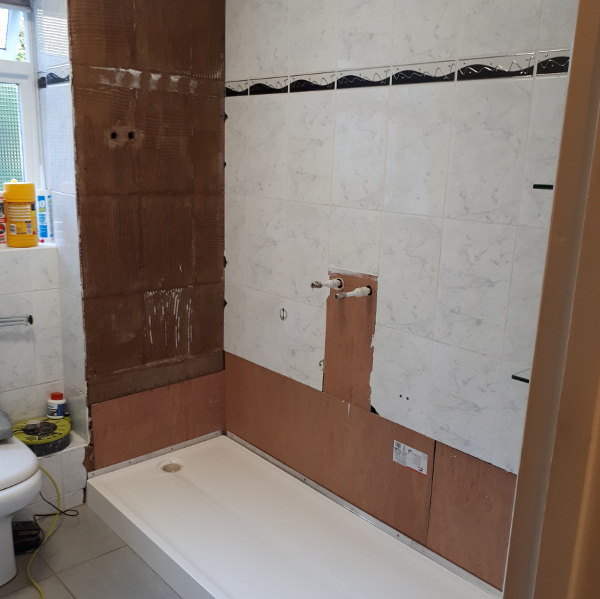 You’ll see that the shower tray installed is 1700mm long, the same as a standard bath, so there was no trouble covering the footprint left by removing the bath. Next we clad the shower enclosure in water proof cladding to complement the existing tiles and fitted the shower seat, shower and grab rails. The shower was finished with full height sliding screens. This is a good example of a bath out shower in job, which is popular with many of our customers. The new shower provides an easy to access showering facility with a seat for support and can be configured to suit many different individuals' needs. 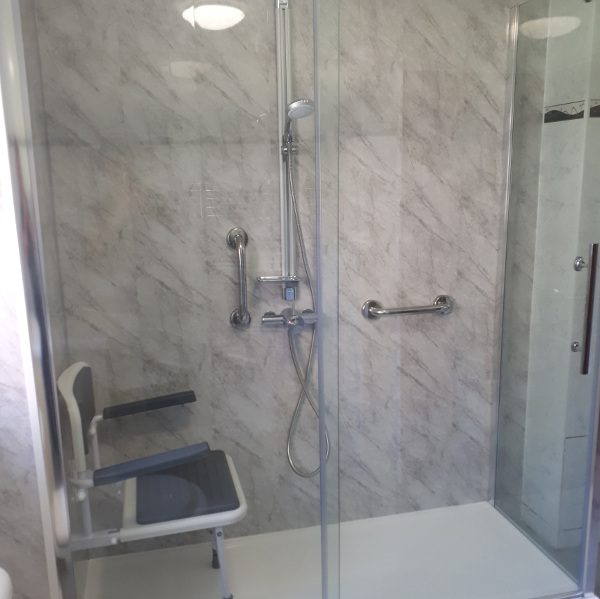 If you or a loved one would benefit from a bath being replaced with an easy access shower, please get in touch with Absolute Mobility today.